Having not drank on Monday evening following my meeting with Gareth, I found it hard to sleep. When things got bad over the last few years, I began to use alcohol more and more just to get through the night, the harder things became, the harder I found it to switch off and sleep, but if I drank, I drank until I simply fell asleep. Gradually it took more and more to get there, but I did, I got so good at it I could fall asleep with an open bottle of wine in my hand and wake hours later without spilling a drop, I would then finish the bottle, get up, get dressed and go to work, still nobody noticed. Now I was fighting it, but in doing so I still couldn’t find peace enough to get through the night. But the battle had started and I was finally willing to fight for myself and what was left of my family. I woke from what sleep I had managed with a new sense of beginning, I knew change was there to be had, it was my time to grasp it. As the day went on, I had in my head the words of the song “Man In The Mirror” by Michael Jackson, love him or hate him, some of his songs are classics, as I went through my work and then karate, I had the words of the song in my head and knew if I wanted change, then I had to be the change. As the evening went by, I heard another voice in my mind telling me to listen to a song called “Healing Begins” by Tenth Avenue North. I knew the song, I liked the song, it was a Christian song by a Christian band, but over the last few years I had taken to listening to some alternative Christian music, I had many Christian artists and songs on my iPod, I enjoyed the music, even if I didn’t understand the content. But as the night went on I couldn’t help but feel I had to listen to this song sooner rather than later. After karate I went to the pub with friends, normally on a Tuesday I would have four pints and then go home and drink whatever I could find in the house, but not now. I hand two pints and then that was it, I got up and left to go home. Half way home, when my friends had all gone their separate ways, I took out my iPod, found the song and pressed play. As I walked down the street listening to the lyrics of this song, it felt like the singer was speaking directly to me, telling me how I had been and how it’s now time to accept the healing the light can bring. I played the song over and over again, all the time crying. That night I failed to sleep again, still the reduced alcohol couldn’t put me to sleep, I struggled my way through the night, so I put my headphones in and just listened to “Healing Begins” on repeat. This entry was posted in Faith, Sobriety and tagged Alcoholic, Alcoholism, Awakening, Bible Verse, Christ, Faith, Freedom, God, Grace, Healing Begins, Hope, Inspiration, Jesus, Love, Mercy, Peace, Poetry, Praise, Pray, Prayer, Rebuilding, Recovery, Sober, Sobriety, tenth avenue north on March 20, 2019 by waynemali. I guess I never really thought it was possible that one could get to the point in life where they have lost touch with who they are. Is that really possible, can we get so far from who we were, that we know longer know ourselves? For me the answer is a definite yes, six years ago today I believe I got to that point and I feared who I had actually become. Flashback to Sunday 18th March 2012 and my whole world was collapsing in around me, five days before I finally realised what I had feared for over two years, that my relationship with Victoria was definitely over, my drinking had put paid to that and now there was no way back, my blindness to who I was had led me down a path that was dark and lonely, at this point in time I believed there was no way back for me. In those five days since the truth of the situation had been released, I had hardly eaten, but my drinking was escalating and I now knew I couldn’t stop it. Every time I felt the need to drink, I tried to fight it, but I couldn’t, there’s only so much scratching at the skin on your arms you can take, only so much pacing around the house like a bear in cage, I had to get out the house to the shop and get something to drink and every time that I did, I cried and repeated “I am sorry, I am so sorry”. Come Saturday the 17th, after karate I went to the pub with friends and drank five pints of strong cider, I tried to get my friends to stay later, but they had lives to get on with, I didn’t any more, so on the walk home I stopped at the shop around the corner and purchased two bottles of wine and sat in my front room and drank them both, then went to bed almost completely sober, all that alcohol and I still believed I was normal, life was sad. But that Sunday I began to collapse in on myself, I found myself in my bathroom staring into the mirror, crying, telling myself how useless I was, how the world would be better without me, how my kids would better off without me, how Victoria would be better off without me, everyone would be better off without me. As I ran a bath, I stared into that mirror and held a knife at my wrists, my intention was to simply cut my wrists and get into that bath and wait to die, life no longer seemed worth living. than live with the memory of what they will find. Then I looked across at the bath and saw a vision that shock me. It was as though I was not there, I was looking down upon the room, I could see myself in the bath, pale, lifeless and in bath of red water and then I looked across the room to the door to see my six year old daughter looking through the door at the same lifeless body I was seeing. I put the blade down and simply broke down, the anger and the pain ran through me, I was so angry with who I was, all because I realised that I neither the courage to live or the courage to die, I was in no mans land, in the void between life and death and not sure how to get back. I cleaned myself up and made it to karate, somehow putting on that karate suit made me become someone else, like a superhero putting on their costume, I left my life behind and became someone who seemed to have it all together, the man in the suit had no problems, showed no emotional damage and no signs of any out of control addiction. But when the suit came off, it was straight to the pub and repeat the previous night, have five pints of strong cider, head home, drop by shop, buy two bottles of wine and proceed to drink as if this was completely normal. During that day Victoria had given me the mobile number of her Pastor, I had know him a while even though I was not a Christian and had no intention of becoming one, but after life had began spiralling out of control over that week, I had ask to speak with Him. Firstly it was purely selfish reasons, if I spoke with him, tell him how sorry I was, then maybe he could talk Victoria round and get us back together, but now after what had happened, I knew I needed to speak to him to get well, to get myself sorted out, I needed help and didn’t know who to speak to, only Gareth. So Monday morning I sat alone in the house after everyone had gone out, fear was growing within and I tried to fight it. I knew I had to make that phone call to Gareth, but I knew life would change if I did, the addict in me tried to fight it, it didn’t want to lose it’s power, but what was left that was human needed to talk, needed help. I fought every fear and though shaking, I managed to make the call and Gareth answered. I could hardly speak, I couldn’t even explain who I was, I tried to tell him I was Victoria’s partner, that’s how he knew me, but I couldn’t get the words out, just tears. Luckily he worked out who it was and quickly gathered I needed help, he arranged to come see me that evening and talk. I put the phone down and life seemed to change from that moment, a clarity start to grow. Victoria was going out that evening, she knew I had spoken with Gareth, she knew he was coming to see me and bringing a friend that I knew also, she arranged for the kids to stay in their room whilst they were here, then she said something that shook me. Normally if she was going out I would run to the shop and stock up with enough alcohol to get me through the night, so she asked if I needed to go to the shop before she went out? That’s how she thought of me now, the hopeless one, addicted to drink, she had tried over the past two years to tell me, to help me, but as an addict you just don’t want to listen, you believe they are just getting at you and turn away. But this night, I knew I couldn’t drink, this was the night to stop, how could she think I would drink in front of them, I reply with “why are we out of coffee?” and then broke down. I’m not scared of them, I’m scared of myself! The sad fact was that I finally realised I didn’t know who I was anymore and tonight I would start to find out, the truth had to start somewhere and it was this evening, with these people. I sat nervously waiting for them and then as they sat in my room, Gareth asked me what was happening and how things had got this way, all I could do was tell him what had happened over the last two years and in particular the last week, all of this between floods or tears, I don’t know how much I cried that night, I don’t think I have ever cried that much before or since. In the course of the discussions I tried to explain how much I was drinking, I gave Gareth an amount, but it was a lie, I didn’t know I was lying that night, I didn’t know the truth myself, that would become clear over the next ten days, when I reached the point that I knew I could no longer drink. But that night before Gareth and Alex, I began to find out who I had become and how low I was, it was a tough way to find out, but it seemed the best and maybe only way. I didn’t realise until months later, that it was God that whispered in my ear that Sunday afternoon and told me my kids needed me, it was God who brought Gareth to my house that night, where he discussed the need for Christ in our lives and told me it was Christ who could calm the storms within my life. Over the next ten days, I began to get control over my drinking and my life, from that previous night I no longer brought alcohol into the house or drank within my room, I was drinking at the pub with my friends, but I had control over it, just two pints, then home. Then come the 29th of March, I came to realised that I no longer liked the taste of what I was drinking, it did nothing anymore, that night as I walked to the pub I stated that if I didn’t like the taste of the first drink, then that would be my last, that drink tasted like vinegar, it was the worst drink I had ever tasted, it was the last alcohol I ever consumed and I intend it to stay that way. The truth is hard to take sometimes, if it’s the truth about ourselves we never want to hear it, we are afraid of it and refuse to believe it of ourselves, but sometimes we just can’t avoid it, I could avoid it no longer, because if I continued listening to my own lies, I would have carried those lives into an early grave. I firmly believe that had Gareth not answered that call and came around that night, then I would not have made it through 2012, my health was a mess, my blood pressure way out of control, even though I was on my medication, my kidneys were being affected and as the episode before the mirror had not been the first time I had contemplated my life in that way, it was the closest that I come to taking it and I am sure that without that night, it would happen again and I would find myself closer to the edge of no return. I am thank for Gareth answering that call that morning, I am thankful the Gareth and Alex came as friends to talk to me, but mostly I am thankful to God for bringing them into my life, that they may lead me to the Son, who would then lead me home. This entry was posted in Faith, Sobriety and tagged Alcoholic, Alcoholism, Awakening, Faith, Fear, Freedom, Friends, Grace, Healing Begins, Hope, Inspiration, Jesus, Love, Mercy, Peace, Poetry, Praise, Pray, Prayer, Rebuilding, Recovery, Sober, Sobriety, tenth avenue north, Truth on March 19, 2018 by waynemali. 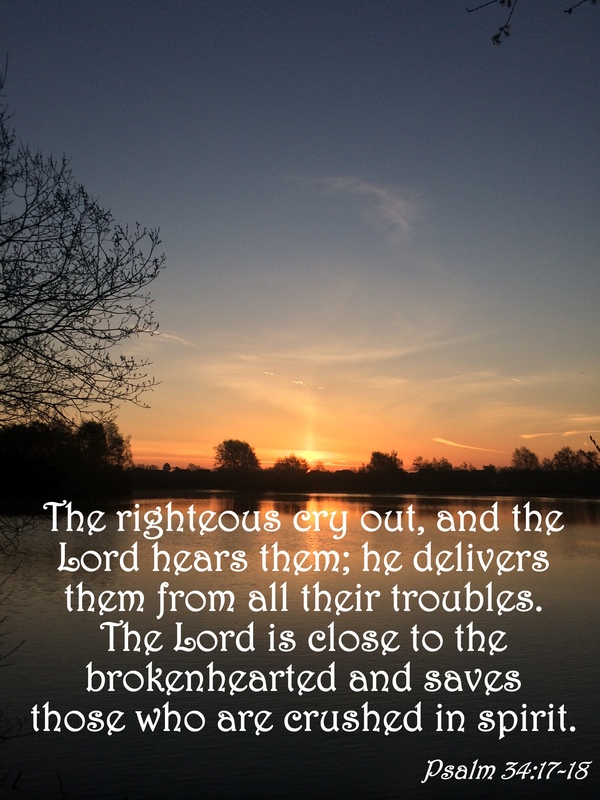 I am thankful that my cries were heard, maybe I didn’t cry out directly to God, but He came to rescue me regardless. Before I knew who He was, before I prayed to Him, His voice told me to listen to certain song, when I heard it’s lyrics I broke down, it was as though the song was written about me, but it is certain that the healing had definitely begun. I still cry when I hear this song, but it’s a tear of joy, of thanks for being saved. This entry was posted in Faith, Verse of the Day and tagged Bible Verse, Christ, Faith, Freedom, God, Grace, Healing Begins, Hope, Inspiration, Jesus, Love, Mercy, Peace, Praise, Pray, Prayer, Psalm 34:17-18, tenth avenue north on March 20, 2017 by waynemali. That night though I could hardly sleep, I just couldn’t nod off, there was so much floating around my mind and because I hadn’t had a drink, I was missing that one thing that usually relaxed me and put me to sleep, regardless of what was going on, this night I hardly slept. I think I got about an hour in total, most of the night I either laid there staring at the ceiling or I was tossing and turning, trying to find a comfortable position in which to nod off. Regardless of how much sleep I actually got, I got up the next morning feeling really encouraged, like the day before had been the first day of a new life, a new me was beginning to break through, I was still in the middle of a really big battle, there was a long way to go, it wasn’t going to be easy, but at least I wasn’t hiding from what was ahead of me anymore, I may pick up a few more scars on the way, but I was now on a journey to a new life. I got through work far more encouraged and for the first time in a week I managed to eat normally, my appetite for food finally returned, I even had breakfast, I never usually have breakfast, in fact hardly ever have I had breakfast, but I decided as today was a new start, I was going to start it properly. After work I went to karate, I felt in a really good mood, in my head I was singing along to the song Man In The Mirror by Michael Jackson, but as the night went I on I got this nagging feeling in my head that I had to listen to a different song, no matter how many times I tried to return to humming Man In The Mirror, this feeling that I had to listen to this other song came back, it was like a woodpecker tapping on the side of my head, it wouldn’t go away, I had to listen to this song and sooner rather than later. After training I went to the pub as usual, but this time I settled for two pints, I left a good hour before I would usually do and walked home. I left my friend at the end of his road and immediately reached into my pocket for my iPod, I just couldn’t shake this nagging notion that I had to hear this song, someone wanted me to listen to this song and wasn’t going to let me off until I had played it. This song had been on my iPod for a couple of years, it was by a Christian band call Tenth Avenue North, I had heard the song many times before and I actually really liked it, although I hadn’t heard it for a while. Although it was a song I knew and liked, I have to say I had never really paid much attention to the lyrics, in all the time I had heard it, right in the middle of all the chaos that I was going through, I had never appreciated what this song was saying to me, but tonight was different, as soon as I heard the words to Healing Begins, I cried, I was walking down the main road in my town in tears listening to this song, a song which was telling me exactly what I had been doing over the last few years and what I needed to do to let the “Healing Begin”, I put the song on repeat and walked home still crying. When I got home I went to straight to what I class as my bed and tried to sleep, I put my earphones on in the end, I gave up trying to sleep, I just kept listening to Healing Begins, like the night before I was finding it impossible to sleep, despite hardly eating for a week and hardly sleeping the night before, I still couldn’t sleep, again I think I got about an hour of sleep in total before getting up for work. I followed my new routine and whilst doing so I played Healing Begins over and over again, something about this song had me hooked, the voice in my head that kept telling me over and over again the night before that I had to listen to this song had won, I was listening to it and I was determined to let it speak into my life. This day was a fairly typical Wednesday at that time, I would go to work, starting at 7.30am, work all day until 5pm, I generally never took my lunch break, I would just work through with a sandwich or something as I went. After that I went to the Architect’s for a few hours, having had a long, hard day at work and not slept properly for the last two nights, I really didn’t fancy being there that long, I thought there was a only a few bits to sort out and I could be out pretty quickly, but thing as usual there weren’t quite going to plan, things weren’t as simple as I thought and a few other things were thrown at me to sort out. I could feel myself getting more and more stressed, this was something that happened a lot, I chose to go there mainly on Wednesday night because I had no karate to rush off to, but I liked to be in and out as quickly as possible, but it never seemed to happen that way. This was going the same way, it was taking longer and longer and soon I began to think about that relief from the stress, to drink, in my mind I began to plan what I would normally do, walk home via the shop around the corner, so I got my work done as quickly as I could in the end and left to walk home, exhausted. Next thing I know I was at home, I had walked by the shop, but not gone in, I hadn’t been in since Sunday and I can honestly say I have not been in that shop since that day, the 18th March 2012 was the last time I brought alcohol into this house, it was the last time anyone brought alcohol into this house. I had my tea and settled down for the night, I can’t actually remember what I did that night, if I just watched the TV or pottered around on the computer, but the next thing I knew it was almost 11pm at night and I had not had a drink and since leaving the Architect’s I had not even thought about having a drink, I had not paced the house, I had not scratched at my skin, I had not lost my patience with anyone and at no point had I longed for a drink, that third of a bottle of wine still sat on the fridge and I never even thought about it. When Gareth had come around two nights before, we discussed praying, I told him about the only time in my life that I had prayed to God, when I was eight and my Granddad had suffered a heart attacked, my Dad had rushed to see him as his wasn’t expected to make it through the night, that night I prayed for God to save my Granddad, I prayed over and over again. The next morning my Mum told us that he had died, from that moment I decided there wasn’t a God, there couldn’t be as he was supposed to listen to prayers and grant them, either I prayed wrong or he just didn’t exist, I guess I didn’t understand that sometimes it is just their time, my Granddad had had a hard life, he had suffered greatly in his childhood in Poland, firstly at the hands of the Nazis and then at the hands of the Russians, before his family had him smuggled out to England, it was just his time to go, but I blamed a God who either didn’t listen or didn’t exist. Over the years my attitude to God had mellowed, I didn’t really believe myself, I knew there was something more to life than we could see, I was fine with other people having faith, but I didn’t want to know. After I had talked about this, Gareth said there was no right or wrong way to pray, just to talk to God, that all he wants us to do. So that Wednesday night, I had come through a stressful night and had got through it without drinking, now I knew there was no way I could do this on my own, I had never had the strength to do this, something was happening to me that I couldn’t quite understand, the night before I had this voice in my head telling me I had to listen to a certain song, then the song spelt out my life at that time and what I needed to do about it, something or someone was helping me in a way that at that time I just couldn’t understand. So I put my headphones in and listened to Healing Begins over and over a few times, then I did something that I had hadn’t done in thirty years. I turned off my iPod, the lights were off, there was no TV on at all, nothing. So I closed my eyes and put my hands together and I began to pray. I thanked God for getting me through this night without drinking, I thanked him for what he had done for me so far, I asked for the strength to get through each day and I asked for peace to get through the night. I was convinced that as I hadn’t drank, then I was not going to sleep again, I don’t know quite what I expected to happen, but I had nothing to lose at this time, I knew I hadn’t done all this on my own strength, so I prayed. The next thing I knew my alarm was going off, it was time to get up and get ready for work. That moment I woke and realised that not only had I slept, I had had the best night’s sleep I had had in years, the most peaceful sleep I had probably ever had, immediately in that moment I knew God had answered my prayer, I felt this immediate sense that I had got my prayer right this time and God was listening. There was a bit of a spring in my step all day after that. Wherever I went I had Healing Begins on repeat. I admit after karate I went to the pub again, but just like Tuesday night I had two pints and then left, I had control over what I was drinking, when I got home I didn’t reach for the bottle over the fridge, I went to bed, prayed and slept once more. Friday became the third night in a week where I never had a drink, I had no urge for a drink at all, it was like something inside me had been removed, that monster inside had been silenced, no longer did it scream for alcohol to fuel it, it was quiet, it was sleeping, I didn’t wake it and it didn’t bother me. I kept listening to my song and I prayed just like I had been for the last few nights, once again I slept like a baby, I didn’t need the alcohol to sleep anymore, I had something better than that, much better. On Saturday, once again I went to the pub again after teaching, but once more I kept it to two pints and left far earlier than normal. But something changed here, I began to tell people what was happening, I told my friends everything that had happened so far and admitted to them that I had become an alcoholic. They kept saying I wasn’t, I guess there are so many people we see in the pub that are always completely drunk, that we just expect every alcoholic to be passed out drunk all the time. I found myself getting angry with them, being an alcoholic is not necessarily how much you drink or what you drink, it’s why you drink and your lack of control over it, I couldn’t get them to understand, not until I told them what I would do after I left them each night, how I would go home and continue drinking, finish it in the morning and go to work, how bad I was when I couldn’t drink. I put on a brave face for karate, I kept this persona of a guy who was in charge of his life, I was a leader, I helped others with their life problems, yet behind the mask, when the superman costume came off, I was a wreck, but I never let anyone see that. It was this night that I finally began to realise just how much I was drinking, it was this conversation and the need to explain to them what I was, that I began to admit to myself and the world just what was really going on. As I say I never lied to Gareth, because I didn’t know the truth, I told him what I knew, but now I was finding out the truth, I was digging deep to explain to these people who I was and I was finally finding out myself. I left after two pints, I never tried to convince anyone to stay for anymore, I was content and I went straight home, no detour to the shop around the corner, home, watch a bit of TV with the kids and then bed, I had a plan for tomorrow and I needed the rest, so I listened to Healing Begins again, prayed and then went to sleep. This entry was posted in Faith, Sobriety, The Story So Far and tagged Alcoholic, Alcoholism, Awakening, Christ, Everyday Champions Church, Faith, Freedom, Friends, God, Healing Begins, Hope, Inspiration, Jesus, Pray, Prayer, Rebuilding, Recovery, Sober, Sobriety, tenth avenue north on April 3, 2015 by waynemali. Last week I approached the week apprehensive due to the significance of the anniversaries that were approaching, it was three years since everything fell apart here at home, but in reality there was nothing to worry about, none of it bothered me and I had a really encouraging week. This week has followed the same pattern, but maybe even better, because this week all the great anniversaries started to come around. On Thursday evening I was at our Encounter evening at Church, when a couple of people asked if they could pray for me, I was taken right back to that very day three years previously when Gareth and Alex came to my house and Gareth asked if he could pray for me. That day on 19th March 2012 came just the day after I found myself in my desperation wanting to cut my wrists, I had been on a bit of a bender over the weekend, drinking more than ever and then on the morning of 19th, I rang Gareth and asked for help, he responded by coming over that night with Alex to talk through things with me. We discussed my drinking, the situation here at home and after listening intently he asked if he could pray for me, I can’t remember a word he said, I just sat there crying into my hands, something I did a lot of that night. But after that meeting I decided my life had to change and it did. That meeting, that night started this amazing journey. I didn’t know God at that point in my life, I hadn’t wanted to, until then, I had nowhere else to turn, so I called Gareth that day and he opened my eyes to the possibility of a life with God and Jesus. When these few people asked to pray for me on Thursday evening, I remembered that night so fondly, it hit home even after all this time, that night was the turning point of my life, all that has come about afterwards was a consequence of that night. I know that God’s hand was on that all along, I know that he led me to that meeting. Then two nights later, three years to this very day, I began praying myself. After a stressful day at work and then an even more stressful few hours at the Architect’s afterwards, I was feeling desperate for a drink when I left to come home. Normally I would have walked straight to the shop before coming home, that night I didn’t I got home, had tea and sat and watched the TV. Normally if I had nothing to drink I would become ratty, pace the house restlessly, rubbing my hands and scratching at the skin on my arms. But not this night, it wasn’t until 11pm that I realised that not only had I not had a drink, I hadn’t even thought about having one, I turned off the TV and the lights, laid down and put my hands together and thanked God for that strength to get through. I asked for peace to get through the night, I had hardly slept over the last few nights, I had had only about three hours sleep over the last two days, all of what was going on was playing on my mind, over and over again. But the next thing I knew my alarm was going off and I had just had the most amazingly peaceful sleep that I had ever had. When I woke the morning after that prayer, I knew that God had answered and that this journey was now starting, I didn’t know where it was going to take me, but I was ready to take it. The three years since have had their ups and downs, but even in the bad times, I knew He was always with me, in the dark times and when I felt desperate to drink in the early days, He took that away. When I fell into depression, He never left me, He went through it with me. Once again it’s been a really encouraging week and I’m sure that this week is going to get even better, I’m really looking forward to being in Swansea next week to share my story there, it’s going to be a great weekend. I suppose there is only one song I could use to accompany this post, the song that on the day between meeting Gareth and making that prayer, I kept feeling that I had to listen to. I didn’t know why, but all evening I had this urge to listen to this song, when I finally did it reduced me to tears, it was like it was written about my life at that very point. I listened to this song all the time during those early months, when I was low I could put this on and feel encouraged. Even when I listen to it now, it brings a tear to the eye as I remember what it meant to me back then. This entry was posted in Faith, Sobriety and tagged Alcoholic, Alcoholism, Awakening, Christ, Church, Everyday Champions Church, Faith, Freedom, Friends, God, Healing Begins, Hope, Inspiration, Jesus, Pray, Prayer, Recovery, Sober, Sobriety, tenth avenue north on March 21, 2015 by waynemali. It’s finally here, the last weeks of counting down the day until I could celebrate my 1000th day of Sobriety, come 10.30pm this evening it will be official, as that was the time I took that last drink on 29th March 2012. It’s funny how it fell at a time of the year where drinking would be pretty integral to the festive celebrations, up until Christmas 2012 I can’t remember the last time I would have gone through Christmas without having at least one drink, even when we were young kids we were allowed the odd shandy made from the beer my Dad would get in for the period. Usually on Christmas Eve I would wander into town to pick out a couple of bottles of sparkling wine to have with Christmas Dinner, I would pick something a little be more expensive than the usual cheap wine I would drink day in day out, of course there was only me drinking it, maybe Victoria would have a glass, but not often, she didn’t really like the stuff. There has been the odd moments in those last 1000 days where the thought of the urge to drink has been high, but I’ve managed to suppress the feeling and carry on with this sober journey, some days it’s not easy, other days you don’t even think about it, you just wake the next day as normal, only with no headache, no fuzziness, no permanent hangover. Towards the last days I had pretty much got the point that I could get through five pints and a couple of bottles of wine, then still go to sleep feeling pretty sober, I wasn’t slurring my words or staggering about, I would simply fall asleep, sometimes still with a drink in my hand. I lost count of the times I woke with half a bottle of wine still firmly clutched in my hand and without spilling a drop, I would wake sometimes around five o’clock, drink the rest of that bottle and then shortly after get up and get ready to go to work, it’s amazing how no one noticed. Although I feel pretty rough today, with a cold which has been brewing over the last few days, I can safely say that even that is far better than the permanent haze that I was walking around in, I wouldn’t change this freedom from that for anything. Things here at home may still not be perfect, not all my prayers have been answered yet, but life is so much better since I put my trust in God and prayed for the strength to get by just one night without drinking, which through His grace turned into a new life without drinking. Each day I wake knowing I still have the gift of the strength to see me through each day, no matter how good or bad the day may be. I have spoken with my Dad this evening, my Uncle is doing much better today, yesterday wasn’t that good following the operation, he was in a lot of pain apparently, but he seems to be in good spirits today, which is very good news, we just await news of whether the operation has been a complete success. It been an amazing journey over the last 1000 days and I have had some amazing experiences of God and His love, but this is just the beginning, just the first 1000 days, I look forward to many more. This entry was posted in Faith, Sobriety and tagged 1000 SoberDays, Addiction, Alcoholic, Alcoholism, Awakening, Christ, Faith, Freedom, God, Healing Begins, Inspiration, Jesus, Prayer, Recovery, Sober, Sobriety, Strength, tenth avenue north on December 24, 2014 by waynemali. It didn’t go unnoticed yesterday evening that I wasn’t my normal self, I wasn’t really engaged in the conversation that followed the DVD were watching in our Connect Group. Given the topic of the DVD, I would normally have a lot to say given my experiences over the last two years. But given the date and what we were watching, I found myself engrossed in my memories of the evening exactly two years ago and my meeting with Gareth. Remember the day before that meeting I was at probably an all time low, drinking more than ever and on the edge of suicide, indeed I had the knife at my wrist, but I couldn’t do it. Then the next morning I fought back every instinct to run and hide, to eventually make that call to Gareth. When he walked into my room that night, it was as though Christ himself walked in with him, hence my choice of song last night, “When You Walk Into The Room”. Seeing Gareth on the DVD last night, talking about community and being there for each other, it was as though I was back on my own settee, watching Gareth sat across the room, talking to me, helping me to open up and start the process of admitting to myself I was a mess and needed help. From that night everything changed, I changed. I don’t think I had really thought that in seeking that meeting I would change everything and turn to faith for help, previously that was a big no-no for me, but that night it definitely opened that door for me. It’s not been an easy two years, there have been so many absolutely fantastic moments, so many great moments, but there has also been a few low ones too, but let’s be honest here, there is nothing that I have faced that was any worse than who I was and where I was when I sought that meeting two years ago. That night my life restarted, it may have taken another ten days to stop drinking and put an end to an addiction which almost destroyed me, but that was part of the process, a part of the journey, an amazing journey. In those early days there was one song that helped carry me through, the night following I had an urge from nowhere to listen to this song, when I did it made me realise what was happening, the Healing Had Begun! This entry was posted in Faith, Sobriety and tagged Alcoholic, Alcoholism, Awakening, Christ, Depression, Faith, Freedom, Friends, God, Healing Begins, Inspiration, Jesus, Rebuilding, Recovery, Sober, Sobriety, Suicide, tenth avenue north on March 20, 2014 by waynemali.